Aisay...very fast it's time to go home. We went "marketing" as usual before setting home. 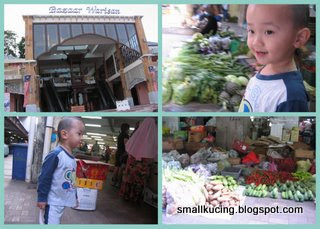 We went to Pasar Payang which is opposite of the newly built Bazaar Warisan. Went to the Bazaar Warisan the day before. Nothing much there. All selling the same thing...kain , kain and more kain. Not cheap. Better go for Pasar Payang. More stuffs to see and buy. Mamarazzi managed to borong a few kilos of Dokong. Wow...so cheap. RM2 per kilo. Also bougght some "mini keropok lekor" and "paung". Sorry, once again no photos here. The mini Keropok lekor is whiter than the normal keropok lekor. Looks like long fish ball. Eat with sambal belacan. The Sambal super spicy punya. Unlike the cili sos for the usual Keropok Lekor which is sweet tasting. "Paung" is a mini bun/roti. The inti are majerin and some times coconut. Taste real good if celup in Kopi "o". 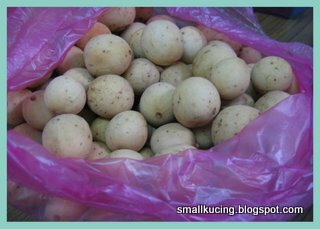 Mamarazzi "borong-ed" these duku from the market at Kampung Tiong. Wah lau eh...RM1 per kilo. Same goes for the rambutan. Super sweet. Errrrr...also no photos as all gone into Mamarazzi's tum tum already. Ish...mana tau when we arrived at Ah Mah's house, Ah Mah also "borong" one whole box of duku for us to bring home. As for me...I got free yellow noodle to eat from my relative who is selling noodles at Pasar Payang..slurpppp...yum yum...breakfast. huh?? yellow noodles just eat like that?? just tarik from the plastic can eat already ah?? not bland meh?? Lol, i got same reaction like SK. I only want the brass kuali... Next time buy one and bring back to KL...and when I go KL, I collect from you. Hehehehehe! 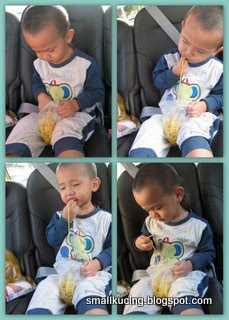 can eat punya..coz when they were making the noodle they "cooked" the noodle too. Pengsan...remind me ya . What size? fried yellow noodles would taste better. Must be a nice great trip and kucing put on weight again! The duku very nice, rambutan also... ooo...auntie still wanna eat duku... eat til addict wan leh! mamarazzi, what CKT stall at Tune's Hotel?? you mean Chow Kit there or Kota Damansara?? i never heard of any CKT stall woh.. got nice one there before meh?? There was a Char Keow Teow Stall at Restaurant Cheong Hua in Brickfield. Very sedap punya. But now the restaurant converted into Tune Hotel. Don't know where the CKT stall moved to. Since you mentioned, your office near YMCA, so Mamarazzi thought maybe you knwo where the stall moved to. orh, ok ok, i know that.. it's not Tune Hotel lah actually, just some other budget hotel but can't remember the name..
that whole coffee shop has moved further up a few shoplots on the same row, very easy to locate one.. and the CKT stall is still there!! yes, i like the CKT and also the pan mee.. very nice!! 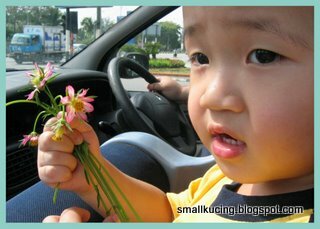 RM2 for a kilo? so cheap.. over here 10rm for 3 kilos.. some more got one box? wow!! Really ah? That is the best news ever! Tomorrow Mamarazzi going to bodek Papa to go there and eat. Thanks a lot. If you sees us in the shop tomorrow, do come over and say "hi". Mamarazzi will belanja you CKT and/or Pan Mee. Smallkucing apa pun makan ah..good lah not fussy with food. Wah..duku is my husband fave. Gwen also eats. But I don't like duku wor.